Chinese, French and Italian energy firms are celebrating the biggest gas find in the UK North Sea in more than a decade. Experts said yesterday the Glengorm discovery showed there is “still life in some of the more mature UK waters”. 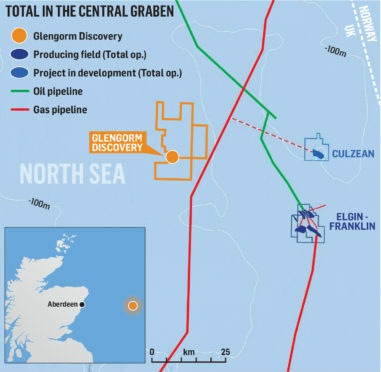 Project partner Total Exploration and Production UK – part of French energy giant Total – estimated Glengorm’s recoverable resources at about 250 million barrels of oil equivalent (boe). At that size, the central North Sea discovery would be not far behind the nearby Culzean field. Total hailed Glengorm, which is 118 miles east of Aberdeen in the P2215 licence area, as “another great success” in the North Sea, following its 180m boe gas find, Glendronach, west of Shetland, late last year. Glengorm’s proximity to other installations means it could be developed as a subsea tie-back. Kevin McLachlan, senior vice-president exploration, Total, said: “Our strong position in the region will enable us to leverage existing infrastructures nearby and optimise the development of this discovery. Total holds a 25% stake in Glengorm, alongside operator China National Offshore Oil Corporation (CNOOC) and Euroil, a wholly owned subsidiary of Italian energy company Edison, which own 50% and 25% respectively. Beijing-based Cnooc also operates the giant Buzzard and Golden Eagle oilfields. The 250-300m boe Culzean field was discovered by Maersk Oil in 2008. Now operated by Total, it will start delivering 5% of the UK’s gas needs this year.